1. This is not your grandma's love story. Ava may be the main character, but the book is about more than just her. The women of the Roux family have a long and sorrowful history of ill-fated love, which Ava catalogues faithfully, beginning with her great-grandmother. Told from Ava’s contemporary point-of-view, she chronicles the lives and deaths of her ancestors, as well as the peculiarly tragic ways in which love made fools of them. Ava herself does not reach the story of her own life until the middle of the book. When I encounter a novel like this, one that reaches far back into the ancestral well of despair, I usually grumble, sigh, and settle in for the ride, prepared to make the requisite investment in past lives and hoping the payoff at the end will be worth it. However, this was not the case. At all. I was as riveted by the three previous generations of Roux women as I was by Ava herself. Each character was so carefully recorded, each taking turns in the spot-light, that my heart was breaking alongside of theirs at every turn of the page. 2. Is this real life? Magical realism--the straight-faced portrayal of events and circumstances so obviously otherworldly--is one of my favorite literary devices, and Walton folds magic into her prose so beautifully, I never question the little oddities that plague the Roux family. Her great grand-mere simply dissolves into a pile of dust. One great aunt transforms into a canary, the other carves out her own heart, and they both insist on haunting Ava’s grandmother. Ava’s mother has a nose able to distill someone’s very essence from the air. Her brother is a fairly mute boy with a talent for drawing maps and talking to ghosts, while Ava herself is born with the speckled wings of a bird. All these things seem highly unbelievable, yet Walton so tenderly relays these facts that I don’t doubt her for a single syllable. Quirky, eccentric, playful, quaint. Call it what you want, but Walton’s writing is marvelous. Literary without being pompous and whimsical without reaching the outlandish, Walton’s writing had me swooning from page one. Her seamless fusion of magical realism and a documentary-like structure melds in the gentle cadence of her lyrical prose. Every sentence had me rapt, and I could’t turn the pages fast enough. Walton tackles every kind of love you can think of, from filial, to platonic, unrequited and purely lustful. She unrelentingly shows how each of these can destroy you, and how that destruction can define you. But she also demonstrates the maddeningly human quality of choosing, again and again, to love. She begs the ultimate question of why it is we love, and presents an answer both poignant and optimistic. Heartbreaking, haunting, and yet strangely hopeful, this book was so very unlike anything else I've read. It was oddly whimsical and literary, two things that don't often pop up in YA. But it was also heartfelt and utterly engrossing. Less than three pages in, I was hooked. By fifty pages, I was on Amazon ordering my own copy, knowing full well I would finish the book before the package even came. 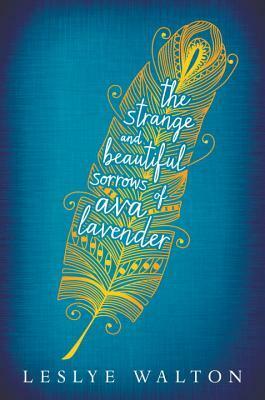 The Strange and Beautiful Sorrows of Ava Lavender just may be my favorite read of the year. This looks weird and wonderful. Thanks for the review! I've had an ARC of this sitting on my shelf for about a month, and for some reason, I just haven't got around to it yet. But your review has me itching to pick it up! Maybe after I finish my current read. I love how whimsical this sounds.